1. “Wow, what a game!” Or maybe it’s “ugh, that game went on forever.” Hopefully everyone is on board with the former, because after a winning series, it sure feels like a glass half-full kind of morning. The White Sox and Twins battled it out for 13 innings before the Twins were finally able to scratch across the game’s winning run in the top of the 13th with a bases-loaded walk. The game was incredibly tight all afternoon with the only scoring being the aforementioned walk, a solo home run by Morrison in the seventh inning, and another bases-loaded walk by Daniel Palka, of all people, in the bottom of the ninth inning. Both starting pitchers, Lucas Giolito and Jake Odorizzi, pitched well on the afternoon and both certain deserved better than no-decisions on the day. 2. Speaking of Giolito, he had a very interesting day to say the least. While I’m sure the advanced metrics won’t be very fond of the start which included four walks, a home run, and only three strikeouts, it felt as if Giolito was in cruise control between two bad innings. Three of the four walks came in the first inning, which he was able to wriggle out of unscathed. After that, he was able to settle into a grove and retire 15 of the next 16 batters he faced, turning what was ticketed as an exit into a solid start. Giolito has set the bar so low for quality appearances that this game easily stands out as one of his better ones despite the fact he still finished with more walks than strikeouts. Perhaps more important than the stat line, Giolito was once again throwing with excellent velocity on the mound, hitting 94 consistently all afternoon, and even ratcheting up to 96 mph in the first inning to get out of trouble. I’m sure this is true of most pitchers, but when you’re able to throw mid-90’s with a decent curveball, you’ll be able to get yourself out of jams more often than not. The velocity is welcome, but the lack of missing bats is still an issue. Hopefully Giolito continues to build on his recent success with another quality start his next time out. 3. As for the Twins, this win was sorely needed to keep their slim playoff hopes alive. The Twins have now dropped back-to-back series to the Texas Rangers (the White Sox next opponent) and this series to fall eight games back of Cleveland in the AL Central. As someone who roots for the White Sox, it’s nice to see the team play spoiler to a Twins organization that has consistently been a thorn in the White Sox side any time the Sox have competed for a playoff spot. The Twins were content all winter to pick off the scrap heap right before spring training and that may very well have cost them a shot at the playoffs. As told by our own Nick Schaefer, their offense is very bad, and who knows what could have happened in they added players like J.D. Martinez and Jake Arrieta instead of settling for Logan Morrison and Lance Lynn. You never know what may happen in the future, so teams should always be ready to take shots at contention when they have an opportunity. 4. 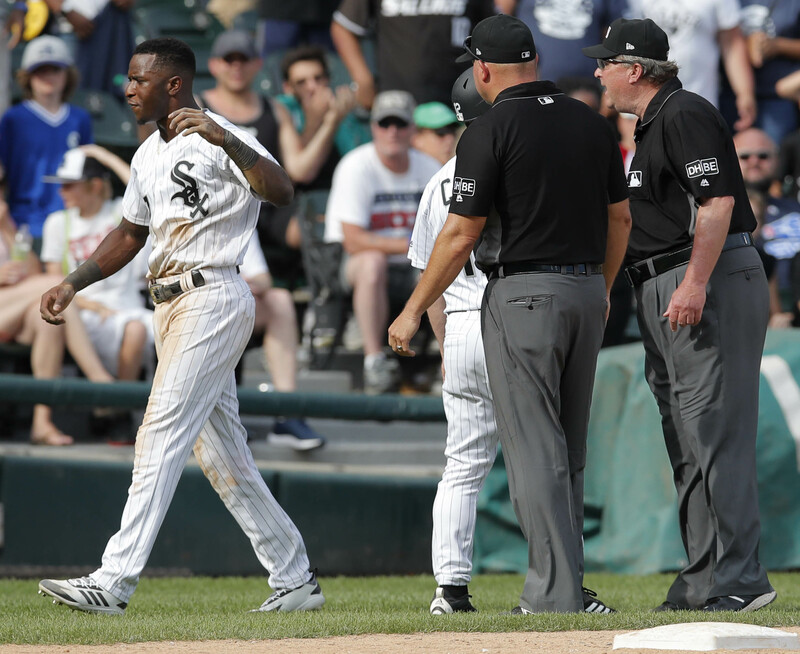 The White Sox young middle infield duo of Yoan Moncada and Tim Anderson had an interesting day at the ballpark, to say the least. Moncada extended his hitting streak to six games with double to the wall in the sixth inning. While it was his only hit of the afternoon (surrounded by a golden sombrero), it is good to see Moncada continue to have at-bats where he really squares up the ball and drives it to the deep parts of the ballpark. I’ll continue to reiterate that Moncada has all of the tools in the world, and when he finally starts understanding the ins and outs of Major League pitching, he’s going to be a monster at the plate for the White Sox. After Anderson went to right field for his second single of the day, his third time reaching base in five trips, he was called out trying to steal second base to end the 11th inning. Anderson was uncharacteristically upset by the results of the review and spiked his helmet in frustration which resulted in his ejection. Rick Renteria had to reach deep into his bag of tricks to handle the fallout from the ejection, bringing Matt Davidson from DH into the game at third base, subsequently forfeiting the White Sox ability to use a DH in the game, and rotating Yolmer Sanchez over to shortstop. Relief pitcher Hector Santiago took Anderson’s spot in the lineup and was in line for a plate appearance in the 13th inning, but Renteria pinch hit for Santiago with Omar Narvaez. Narvaez promptly struck out. 5. With the loss, the White Sox dropped to 28-52 on the season, and the loss ruins the White Sox’ chances at finishing the month of June with more wins than losses. Still, with the return of both Avisail and Leury Garcia, as well as Carlos Rodon and the presumably impending promotion of Michael Kopech, some brighter days are on the horizon. Next up for the White Sox are the Texas Rangers, a team the White Sox defeated three times in four games when they met in Chicago a little over a month ago. It’s a spot on description of the Twins lineup woes.